Eyeglass frames: This benefit usually comes as an allowance. Depending on the coverage level, you can receive a $130 allowance up to $220. This benefit is also once per year. Eyeglass lenses: Lenses will be benefited as a copay. Most are around the $20-$30 amount, also per year. Contact lenses: For contacts, you could see either a copay or as an allowance. LASIK surgery: Most insurers offer a discount on a type of vision corrective surgery. The discount amount varies from company to company but is generally about $500. Additional exams beyond the one per year. Replacement of damaged or lost glasses unless appropriate warranty insurance is purchased. Missed appointment charges, application fees, or other miscellaneous charges. Non-prescription glasses, like magnification reading glasses. Any treatment to the eye that is medical in nature. These injuries, surgeries, and treatments should be covered under the insured’s health insurance policy. Treatment where the doctor is a member of the insured’s family. Check their websites for rates and availability. To assist you, we have chosen three highly rated companies that provide vision insurance for you and your family. These choices will be from the open market. Note: If you have children under the age of 19 and you currently have health insurance through the marketplace, they will already have coverage for vision. This a mandate under the Affordable Care Act. VSP is the largest vision insurance company in the United States. If you have vision insurance, chances are it is with VSP. VSP offers low copays, high allowances, and is widely accepted across the U.S. VSP has been awarded Best Vision Coverage by the Benefits Selling magazine Readers’ Choice Awards for the last eight years. Depending on where you live, premiums for a standard individual policy can begin at a little over $15 per month. Family plans are just under $40 per month. 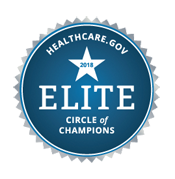 EyeMed received a four-circle per rating from J.D. Power based on overall customer satisfaction. Vision insurance through EyeMed is accepted at over 44,000 independent and retail providers. Most insurers offer a 20% discount on a second pair of glasses within the policy year; EyeMed offers a 40% discount. Committed to the community, EyeMed is also a proud supporter of OneSight, a nonprofit organization that provides vision care in underserved communities across the world. EyeMed’s individual vision discount plan begins at $5 per month, and the family plan is more extensive, with allowances and copays. It starts around $30.